We Made It to Montreal, But Can We Leave Venezuela’s Turmoil Behind? 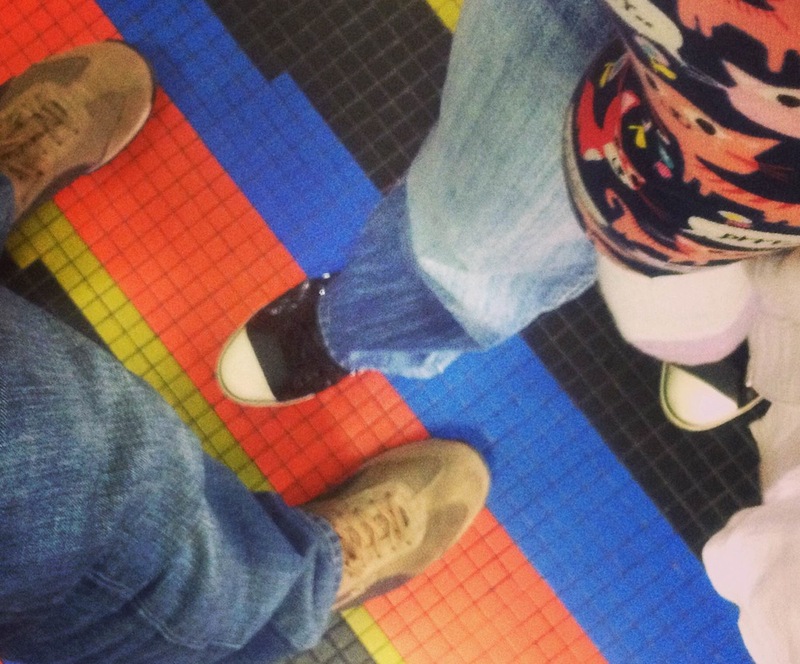 At the Simón Bolívar International Airport in Caracas on March 19, my wife, 8-month-old daughter, and I stopped to take photos of our feet. We were standing over a colorful, geometric mosaic made by the famous artist Carlos Cruz-Diez, a symbol of the modern and cosmopolitan Venezuela we loved and the Venezuela Hugo Chávez and his followers have tried to destroy. This has become a ritual among those who are leaving Venezuela. That day, my family walked onto an American Airlines flight with four bags of luggage and three things that were exceedingly precious in our home country: airplane tickets, an invitation to stay with my sister in Florida, and hope. Until the moment the plane took off, we feared we might be in clear and present danger. We had just spent the last month seeking refuge in a makeshift panic room we created in our Caracas apartment. And, even as we navigated the airport’s departure rituals, we didn’t know if we were leaving Venezuela forever and if we’d ever be able to leave the turmoil behind. During the previous years, we said goodbye to a lot of friends who moved to Spain, Portugal, Argentina, Colombia, and the United States. We wanted to stay, however. We were proud of the job we were doing as journalists, writing about the problems our country was facing and possible ways to solve them. We wanted to help our society to go back to the path to democracy, interrupted in 1998 by the return of army men to power, with the election of Chávez, a career military officer, who had failed to take over the government in a bloody putsch just six years before. But the majority of our fellow Venezuelans had other plans. In 2009, when Chávez obtained the popular support to reform the constitution in order to rule forever, my wife and I accepted that we wouldn’t be able to live under an elected dictatorship, a government that also would be unable to stop the inflation and crime rates that now are among the highest in the world. As newspapers were being whittled down and journalists feared speaking against the regime, it became virtually impossible to do the work my wife and I were trained to do. We made a list of places we could go. We put Canada first: we wanted stability and a legal way to immigrate, and that country offered professionals like us a path that was easier and faster than the U.S. We chose Montreal (because Quebec’s list of desired professions included journalists at that time), submitted our application in 2010, and studied French. The arrival of our daughter in July 2013 delayed the process. We sent all the required paperwork, but the months passed with no word from Citizenship and Migration Canada. In December 2013, we made extra cash from a freelance job and decided to invest it in tickets to Miami. We needed to pick up some savings we had socked away in a U.S. bank and buy some essential things we would need when we finally made the move to Canada. But the meaning of that planned Florida trip changed as a result of a conflict between the government and international airlines—a conflict that made our purchased tickets suddenly seem precious gold. This was the latest step in the Cuban-inspired Chavista effort to extinguish all private economic activity by asphyxiating the value of all money belonging to anyone but the state. After a decade of currency controls that forbid anyone other than the Central Bank from acquiring U.S. dollars, many foreign companies have stopped doing business in Venezuela. Hence, this year we have in Venezuela, among our long list of wants, no shampoo, no elevator parts, no cancer medicines. We’re in an undeclared state of default that’s cutting ties with the rest of the world. Now, foreign airlines are reducing or canceling their operations to and from Venezuela. They were tired of waiting for the almost $4 billion the government has to give them in exchange for the bolivars (essentially play money for a multinational company unable to exchange them on a free liquid market) they earned. With no dollars, the companies cannot pay services abroad or buy replacement parts. When violent protests erupted—literally a half-block away from our home—in February against the government of Nicolás Maduro, Chávez’s heir, my sister in Weston, Florida, said, “Please, come right now.” We knew by then that our tickets would be the key to an exit door out of all that danger. It could also be a launching platform to the North. We asked my sister-in-law to move to our house and take care of it and our cats. We hugged our loved ones and told them we didn’t know when we’d be getting together again. We attended the dinners our friends organized to say goodbye. And then we took the time-honored Latin escape route: the plane to Miami. While we were grateful for safe harbor, the city of Weston is a strange place for a Latin American, even if many Venezuelans, Argentinians, and Colombians live there. We’re used to seeing macaw couples rowing over the traffic jams; in Weston there’s no nature—all of that has been obliterated to make room for acres of silent suburbia. There’s no architecture: Each building is a representation of something else, because the place is too recent to have an urban history. There’s no complexity: The streets offer to the eye a narrow palette of master-planned landscape options. The order is soothing, to be sure, and those weeks in Weston were like a decompression chamber—that temporary holding tank where divers who come from the darker bottom of the ocean can undergo a protected transition before returning to the normal air of the surface. Even if we were (and still are) terrified about burning through our savings, Weston reminded us that another life, a good life, is possible. The first days there, my wife used to stand in front of the supermarket cases full of brands of yogurt, stressed out by her inability to decide which one to choose. For months, finding any yogurt in Venezuela had been an epic achievement. “About 80 Venezuelan families arrive every week,” someone in the real estate business told us. Middle-class, of course, or upper: in Venezuela, the poor don’t emigrate. A prominent TV executive I met there told me that famous Venezuelan media personalities, the kind of people we thought would never leave the country where they are—or, were—kings, were begging for jobs in Florida as well. Almost a month into my Floridian interlude, on April 15, at 3 a.m., I went out of my sister´s condo to see the total lunar eclipse. The moon, passing through the Earth’s shadow, was an astonishing salmon circle, and a red Mars shone very close. I was alone with all that beauty and my own constellation of questions. Had Canada forgotten about us? Could I find a job in Miami, or would I have to return to the battlefield that we still call Venezuela? The idea of returning made my heart race. In just the short time I had been away, dozens more journalists had been forced to quit or pushed to virtual bankruptcy because they didn’t want to be controlled by the regime. And everyday life was getting worse, too: My mother in Valencia has had to close her eyes when she takes a shower, because the water is so polluted that it’s made her cry. The eclipse turned out to be a good omen. That very day, in the afternoon, Canada’s immigration agency sent the brief email that changed our lives. Our skilled immigrant visas were ready. On May 8, we landed in Montreal. As a resident of Canada, I feel like Princess Leia watching her home planet Alderaan explode from a window of the Death Star. I wish I could send some Millennium Falcon to rescue all my people. But I have my own family and future to worry about, too—the challenge of finding a decent job, for starters. For most of us, exile is an opportunity, not a guarantee. I am no longer a relatively well-known journalist but an immigrant. I have to reinvent myself; nobody here cares that I was a writer in another country, in another language, in another saga. It’s up to us to fit into this old, welcoming city, and connect to its narratives, even as we keep an eye out the window, on Alderaan’s remains. My wife and I take our baby to the parks and streets of Montreal every afternoon. French-speaking grandmas grab her cheeks and applaud when she pays them with a smile. Our daughter is enjoying the gulls of the St. Lawrence River, the summer green on the maple trees, the slow sunsets. She’s learning to walk. *Photo courtesy of Rafael Osío Cabrices.